Wellington Equestrian Classifieds Boards » ANNOUNCEMENTS » Community Events » Palm Beach County's local animal rescue community comes together - Sept. 8 from 10 a.m. to 4 p.m.
Palm Beach County's local animal rescue community comes together - Sept. 8 from 10 a.m. to 4 p.m. Anyone who has ever come home to the sight of a dog’s wagging tail or felt the soothing vibration of a purring cat knows that living in a sans-pet household is unthinkable. After all, in exchange for some kibble, water and a comfy spot to sleep, our furry companions give us so much. Hey, there’s a reason why some 94 million cats and 90 million dogs enjoy the domestic creature comforts we animal lovers so willingly provide. Unfortunately, there are a great many more four-legged friends that need forever homes than currently have them. That’s where the 5th annual Countdown 2 Zero(C2Z) — Palm Beach County’s largest one-day dog/cat/puppy/kitten/rabbit adoption event — comes in. Organized by Peggy Adams Animal Rescue Leagueand Palm Beach County Animal Care and Control, and presented by The Lois Pope LIFE Foundation, the event is a collaboration of nearly two dozen animal rescue organizations in Palm Beach County. Scheduled for Sept. 8 from 10 a.m. to 4 p.m.inside the air-conditioned South Florida Fairgrounds (East Expo Center) in West Palm Beach, the event will feature hundreds of irresistible animals who need a permanent residence to call their own. "On this day, the local animal rescue community comes together, united in our efforts to save the lives of homeless animals in Palm Beach County,” said Rich Anderson, Executive Director/CEO of Peggy Adams Animal Rescue League. “Together, through C2Z, we are working to save the life of every single adoptable animal in our community." 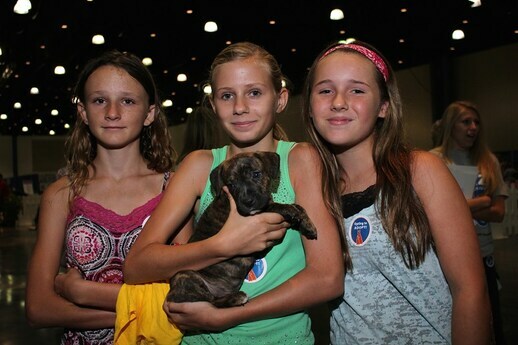 At last year’s C2Z event, 273 grateful animals got to go home with their new owners. Since its 2014 inception, C2Z has matched more than 1,000 local shelter animals with new pet parents. And there’s a good reason why the event is so successful at placing its animals in forever homes. “We take a very personal approach in matching each and every animal with their new owner,” said Lauren Ellis, Development and Marketing Manager at Peggy Adams Animal Rescue League. What that means is that long before Sept. 8, C2Z staffers and volunteers will have become well-acquainted with the animals. Which ones get along with other animals. Which ones are afraid of other animals. How do they interact with kids? Then, after extensively interviewing prospective pet parents about their households, their lifestyles, their likes and dislikes, etc., the best matches become apparent. Not only does C2Z want to find homes for this year’s available and adoptable animals, but the initiative is even more ambitious about the future. A laudable goal to be sure — and one that every animal lover in Palm Beach County can help them achieve. Where:South Florida Fairgrounds - Expo Center East (9067 Southern Blvd., West Palm Beach). When:Saturday/Sept. 8 from 10 a.m. to 4 p.m.
What: This free event is Palm Beach County’s largest annual pet adoption event, featuring hundreds of adoptable animals (dogs, cats, puppies, kittens, and more) from more than 20 local rescue organizations. Every animal is seeking a new forever home*. *Adoption policies and fees vary by rescue organization.